While "The Empire Strikes Back" stands up to "Star Wars" far better than most sequels stand up to their original, this second installment of George Lucas' saga is when his formula starts to show its seams. 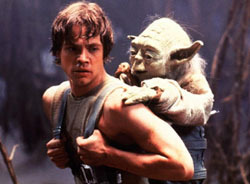 For instance, this is the movie during which we the audience realize Luke Skywalker really isn't all that bright. In his first scene in "Empire" (one of a few scenes that has been refurbished for this re-release), our young, reckless hero is bonked on the head by a space Yeti and dragged to a cave while patrolling a snowy planet. As night draws near and the temperature drops below what a human could endure, Luke manages to escape by lopping off the monster's arm and running away into the blistering wind and snow. Um, Luke buddy, how about killing the thing and staying sheltered in the cave while you radio for help on your little wrist walkie-talkie? While it is a joy to revisit this sci-fi classic on the big screen after 17 years, fans will realize with this revival that "Empire" is really only a good movie considered great by association. Lucas's story is heavy with thoughtful, coming-of-age philosophy as Luke learns the ways of the Jedi warrior from Yoda on the swamp planet Dagobah. It is brimming with surprises and stellar action as the Millennium Falcon goes head-to-head with Imperial Star Destroyers only to escape into an asteroid field. It even has a shadowy, two-faced ally in the form of Lando Calrissian (Billy Dee Williams), Han Solo's gambling buddy who turns Han and Princess Leia over to the Empire when they visit his city that floats in the clouds. But Williams' cardboard performance serves as an example of where "Empire" unravels. All the stars offer up one-note performances here. Mark Hamill plays Luke with delayed teen angst, Harrison Ford (Solo) opens his mouth only to make a wise crack to Leia, and Carrie Fisher (Leia) invariably responds in kind like some intergalactic Gloria Steinem. Directed by Irvin Keshner, whose modus operandi is action sequels (he went on to make "Never Say Never Again" and "Robocop 2"), this movie focuses most of its energy on excitement. The battle between rebel troops and the Empire's AT-AT snow walkers -- armored seven-story, four-legged attack dogs -- is spectacular, as is the inevitable and exhausting lightsaber duel between Luke and Darth Vader. But with the film's focus on adventure -- and the effects, which still stand up to anything Industrial Light and Magic has to offer today -- originality received back-burner treatment. Couldn't they have come up with something more creative for the evil emperor than a gravely-voiced guy with a craggy face and a Grim Reaper robe? I don't mean to cap on "The Empire Strikes Back." It is still one of the better sequels Hollywood has ever produced, and it's considerably better than most of the movies offered up so far in 1997. But under 17 years worth of scrutiny loose ends are bound to be exposed, and what they expose is the fact that this movie is just screaming "second of a series." It doesn't stand on its own. But at least it isn't plagued with teddy bears. We'll have to wait until "Return of the Jedi" on March 7 for them.